Michele Glazer's books of poems are It Is Hard to Look at What We Came to Think We'd Come to See (Pittsburgh, 1998), which won the AWP Prize, Aggregate of Disturbances (Iowa, 2004), which won the Iowa Poetry Prize, and On Tact, & the Made Up World (Iowa, 2010), published in the Kuhl House Series. She has received fellowships from the National Endowment for the Arts, Regional Arts & Culture Council, Oregon Arts Commission, and Literary Arts. 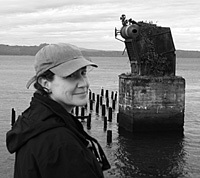 Glazer teaches in and currently directs the MFA Creative Writing program at Portland State University.